For years I wrote regularly for Bristol-Myers Squibb’s internal communications website Intouch. Here is a profile I wrote of senior Bristol-Myers Squibb executive Mike Seeley. It appeared on the site in 2008. Mike Seeley, senior vice president, Europe, and General Manager, France, has worked for Bristol-Myers Squibb for 38 years in seven different countries. He has never held a job in another company. He joined what as then Bristol-Myers fresh out of commercial school in the U.K.
Seeley says the secret to his longevity lies in the company’s ability to keep generating new and more interesting opportunities while at the same time retaining a consistently dependable context for that work to take place. Seeley’s varied experiences have served him well. “When Mike joined the EMEA team, he brought with him his diversity of experience and perspective from his leadership roles in the company,” says Beatrice Cazala, president, Europe, Middle East and Africa, Asia-Pacific. “His knowledge of the company and his management style led to the successful integration of our current EMEA model. He was able to quickly adapt to the challenges and gain consensus from some of the newer leaders on the team to help drive our strategy forward. Mike is a key pillar of my leadership team,” Cazala adds. Mike Seeley, senior vice president, Europe, and general manager, France. Over his career, Seeley says he has come to prize developing people more than any other responsibility. “As a manager, talent development is one of the key things I do every day,” he explains. “When I look back at the end of the year and assess my own performance, if I can’t identify a pretty good list of people who have developed and earned promotions or development opportunities or have been trained and taken on new roles, I don’t think I’ve done my job. Clearly Mike Seeley must have seemed like one of those. Seeley was born and grew up in Zimbabwe and moved to London where he attended the London School of Business. He started out at the company doing statistical and financial analysis. In his view, his first significant role came when he moved to the “operational” part of the business, becoming an export manager for Austria and Central Europe; it was, of course, during the time much of that region was still communist. Over the next two and a half decades, he continued to work in the region in a variety of roles, becoming increasingly versed in its economic and social structure. 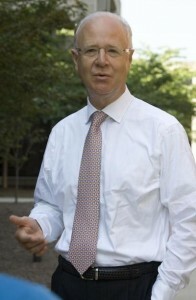 Seeley was promoted to vice president with responsibility for Central Europe and Israel in 1998. Three years later, he moved to Prague and the following year he was appointed vice president and general manager, Scandinavia, Central and Eastern Europe and Russia. So, in 2001, Seeley was well prepared when the company began preparing for the growth of the EU. “We formed a cross functional task force that managed all the pre-regulatory process, working with the regulatory group in Brussels and so on, getting our organization set up for a different operating environment,” he remembers. In 2004, Seeley was appointed vice president, EU Markets, with responsibility for a complex region of countries, including Austria, Belgium, Central Europe, Ireland, Greece, The Netherlands, Scandinavia and Switzerland. This was a region that was in “steady state” mode, according to Giovanni Caforio, now senior vice president, Bristol-Myers Squibb U.S. Oncology, who at the time was in charge of European Marketing. Seeley could reasonably have managed it as it was. But there were issues apparent to Seeley and his new colleagues. Many of the businesses in the various countries were focused on mature products that were not in line with current company priorities. So Seeley met with members of his leadership team to take a long look at the region’s business. The plan they developed called for all of the company’s resources in the region to be focused only on new products; the mature products were to be outsourced to distributors. It also called on the company to simply leave certain countries where business did not rise to a critical mass. If the plan worked, it was likely to be a very significant change but one which would net the company substantial savings while at the same time re-enfranchising the organization. After presenting it to management and winning approval, Seeley, empowered his managers to implement it. The result, Seeley says, was not only as successful as hoped — $26 million in savings — but employees like Blin were given “defining career moments” in the bargain. Because of that reorganization and because of his earlier strong support for a transformation in EMEA — moving the European countries toward a system of pan-European brand managers based in Paris — Veitch says Seeley was a key influence in the company’s current European configuration. The region today looks fundamentally different than it did when Seeley started working in it. “The change in the European business model is due, in part, to Mike’s leadership style and collaborative skills gained from managing so many countries in the region,” Veitch says. Of course, that gesture will only get him so far. The company’s business in France is the second largest market in the company’s portfolio after the U.S. (Bristol-Myers Squibb is number 10 in France, number 13 in the world). The French business faces significant access issues from a government that despite its conservative leadership is still presiding over a socialized reimbursement system which is still looking to find ways to save money. A case in point: a government program called ACBUS which focuses specifically on replacing prescriptions for Plavix (clopidogrel bisulfate) with prescriptions for aspirin. When I joined the French operations my immediate priority was to stabilize the organization, and refocus on the period of growth we felt was in front of us by building on the very successful launches of Sprycel [dasatinib], Baraclude [entecavir] and Reyataz [atazanavir],” Seeley says. Since assuming his new role, Bristol-Myers Squibb France sales grew by 6 percent in 2007, excluding pravastatin, which has been severely impacted by generics and is on track for overall growth of 8 percent in 2008. Leading products include: Plavix, Aprovel, Reyataz, Sustiva, Sprycel, Abilify (aripiprazole), Orencia (abatacept), Baraclude and Efferalgan. Seeley and his team are already creating a new model and on the specifics for France. Given his track record, Veitch says Seeley is the ideal person for that and the other challenges the French business faces. “Mike is the perfect person to steer project teams. He keeps his focus on the goal, engaging all points of view and meets the team objective ensuring that the varied viewpoints are represented,” he says. Most people who know Seeley say that some of the most important of his characteristics are deceptively absent from one’s first impression. For example, Seeley is an avid art collector, and specializes in collecting pieces by young, central European artists (not unlike developing talent). He has recently been taking golf lessons with his son (one of two teenaged children with his American-born wife) who he confesses is much better at the game than he is. He says he reads as much as he can. The last book he read was “Rainbow’s End,” a biography about Rhodesia (now Zimbabwe) during the civil war there in the 1970s. He says Lamberto Andreotti teases him because he and his family are the only people he knows who would travel from Paris to New Jersey for vacation. Seeley is also known for his sense of humor.